Fully automated grading machines are fast becoming the norm, but they still require competent graders to work in tandem with the machinery, make inspections and to apply the appropriate corrections. This requires people who are not only expert lumber graders, fully knowledgeable of all the grading rules and how to apply them, but who are also technically competent enough to trouble shoot equipment and correct any grading issues. Most mills that added scanning equipment have kept their qualified graders to help inspect and audit production and, with the help of the equipment supplier, they have trained these same people on the operation of the scanning equipment. Now is the time to consider who will replace these people when they move on, and how will we train their replacements? The role of the line grader is changing from line grader to inspector when optimization is installed. This new role requires a little different skill set. Instead of making quick, reasonably accurate grade and trim decisions on the fly every few seconds, now these graders are required to accurately and more precisely inspect the production and evaluate the decisions made by computers. When grading on the chain there was a certain amount of room for error, as a person could only be expected to handle a limited amount of decisions at a time. Now, when inspecting lumber graded by machines, the graders, more appropriately referred to as inspectors, must be able to correctly evaluate the machine decisions. This requires a new skill set. The inspector needs an in depth understanding of the grading rules and how to apply them, as well as in depth understanding of the capabilities and limitations of the scanning equipment. The graders (inspectors) now have to be at least as competent as the people who trained them, usually the inspection agency staff, to do their job correctly. Without adequate knowledge, misinterpretations and/or undetected mistakes can become an extremely costly experience in a very short time frame. Opportunities for increased grade recovery may be overlooked. 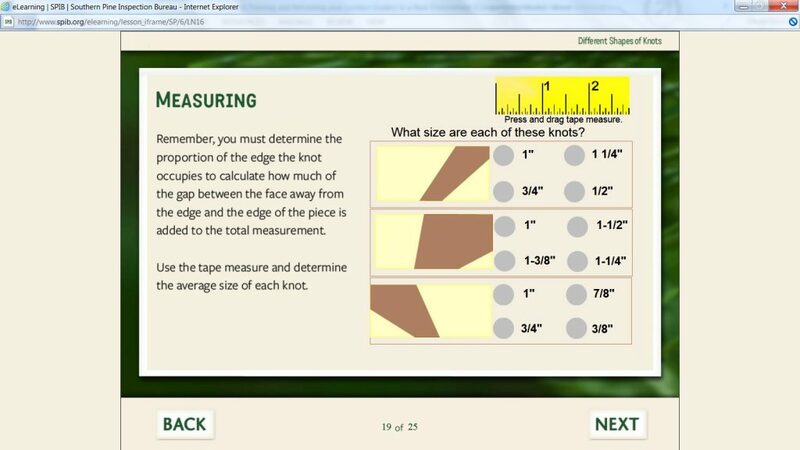 Graders working with scanners must now fully comprehend how the knots are located within the cross section, how to measure all the different shapes and types of knots, and how to evaluate knot quality and location. These inspectors must also know how to identify and evaluate defects and characteristics that some scanners can’t fully evaluate like compression wood, wormy pitch, sapwood and heartwood decay, pitch streaks and timber breaks. How do you know if your staff is up to the job? Do you ever evaluate or test their knowledge of the rules? 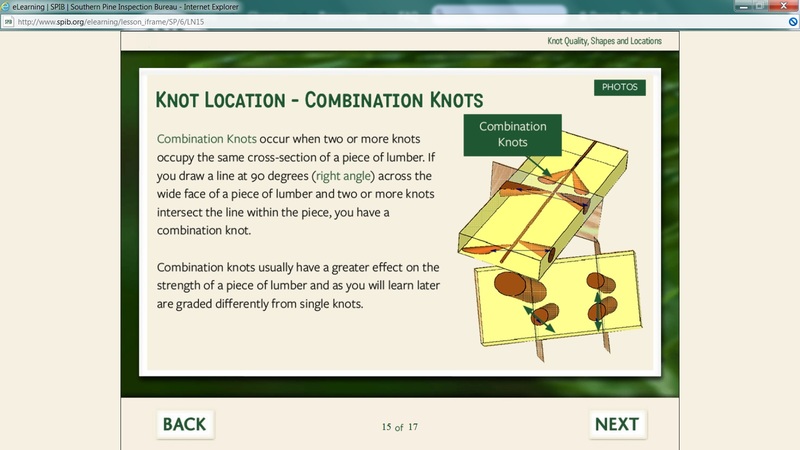 Do you assess their skill and ability to correctly grade knots? Most importantly do you provide innovative training methods that will help them in their new roles? They are no longer learning by doing, reviewing their mistakes in the shed with inspectors, and honing their skills on the chain. They are depending on previously learned skills and knowledge obtained using the old methodology. How can we continue to develop, train and monitor proficiency of graders in this new environment? Training new graders is becoming more and more important with every retirement or promotion. We all lose when decades of knowledge and experience leaves our industry with no formal process to retain and develop that knowledge. We will continue to set ourselves back unless training new graders continues to be addressed with innovative types and methods of ongoing training. So how do we continue to develop and train new graders for the industry when shed and chain coaching is not the norm any longer? 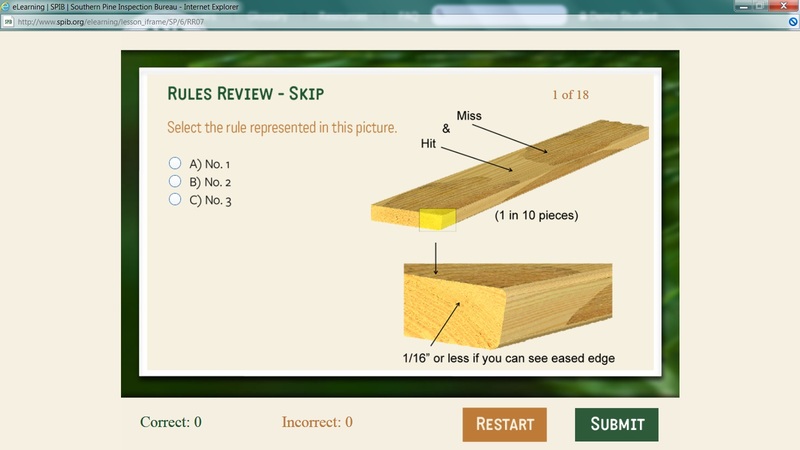 SPIB now provides a new approach, which leans heavily on use of a set of online grading courses for dimension lumber that will accelerate education of any lumber grader, provide practice and review for experienced graders, which is self-paced and easy to access and use. These courses are well suited to the new, more technically orientated lumber quality technicians (inspectors) that must learn to audit and interact with grade scanning equipment. With these SPIB eLearning courses students can obtain all of the essential training materials with diagrams, drawings charts and interactions to describe the more difficult concepts; rules review drills to re-memorize all the rules, visual knot grading practice; all online and available wherever and whenever they have access to the internet. Grader training on the grading chain and shed coaching by reviewing mistakes has become obsolete for mills with grade scanners. SPIB eLearning courses are an effective tool to fill in this gap. Any training will be well received and will provide the intended results when you provide training that is interesting, targeted, engaging and is simple to access and use. These courses do not come across as testing, they are not tedious and stressful like most online training courses; on the contrary they are engaging, interactive and encourage practice and review. How you present any type of training is important. You want your employees to know that you see them as individuals that have the capacity to improve and contribute, and that you are willing to invest in them as valuable assets. When you introduce SPIB eLearning as a tool which you invested in for the sole purpose of helping your employees to improve their job skills, then it will be received positively by the students. The effects of investing in your employees and treating them as assets will be returned to the company many times over. If your employees understand that you are willing to make an investment in them it can change their approach and way of thinking about the importance of their job. Training can improve employee self-esteem and retention which will lead to an improvement in efficiency and increase grade recovery. 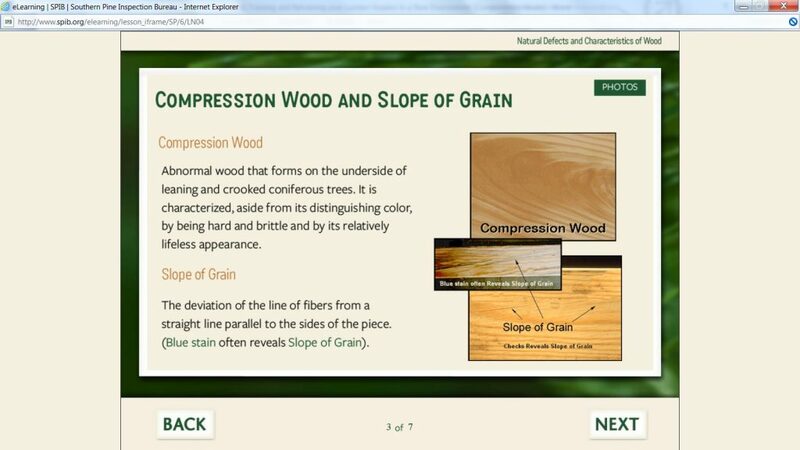 Understand that these courses will also benefit mill line graders and grader trainees; and because they can be accessed from any computer with an internet connection, others in our industry with a need to better understand how dimension lumber is graded can use these courses at their convenience. In the past all this material was only available through word of mouth from experienced lumber inspectors. Now mill managers, supervisors, and support staff; as well as lumber sales staff, retailers, architects, engineers, and foresters can go through these courses whenever the time is available. Training these types of employees on how dimension lumber is graded use to require classroom and on the job instruction. With the availability of eLearning it has become practical to deliver this information to diverse groups of employees. Take advantage of this innovative approach to training soon. 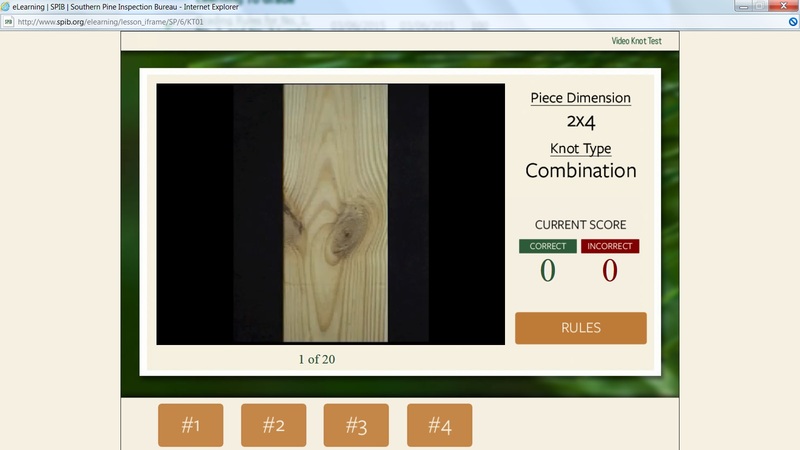 Now you can easily bring everyone up to speed on the details of how your dimension lumber is graded. These courses provide countless hours of face to face training materials and explanations in concise and easily accessible form. SPIB is committed to working with our customers to establish the highest standards and ensure a sustainable, successful future for the industry. 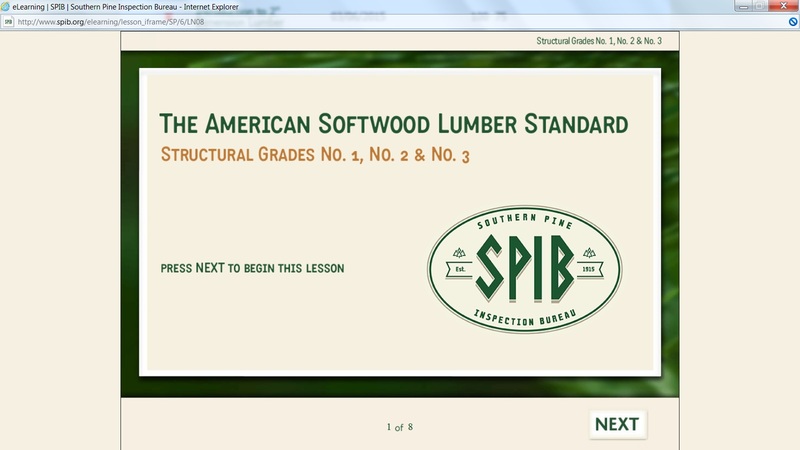 All grading rules for Southern Pine are maintained by SPIB and are the standards for the entire Southern Pine industry.